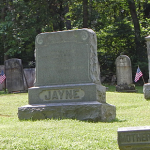 Coordinates below are for public cemeteries or cemeteries accessible from public roads. For private plots, please ask at the Wyoming County Historical Society for directions. If you can add to or clarify this list or know it needs to be modified, please contact us! Lake Winola Cemetery: 41°30’56.5″N 75°51’28.7″W ?? ?